The next big Windows update isn’t expected to arrive until just over a year from now, but a fresh leak from inside Microsoft offers a taste of what’s to come with the new operating system. Some internal marketing materials obtained by Re/code’s Kara Swisher include a poster for Windows 9 “Threshold,” though it doesn’t really offer any specific details. 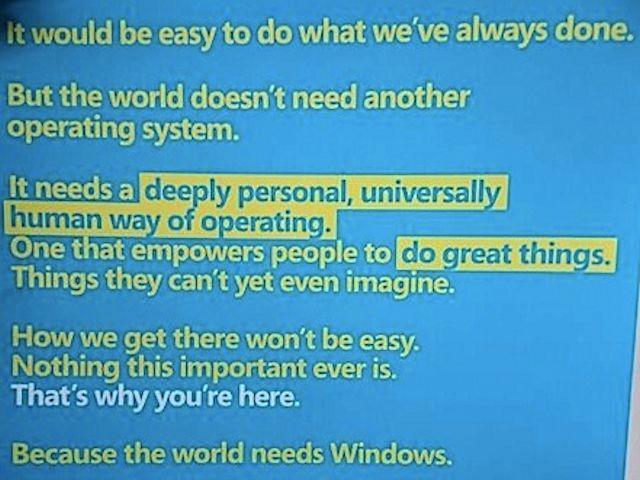 Instead, the alleged Windows 9 poster promises “a deeply personally, universally human way of operating.” This might be our first look at the marketing push behind the new OS, which Microsoft notes isn’t just “another operating system.” There’s also the highlighted words “Do great things,” which sounds like a potential tagline for the software overhaul. Based on recent rumors Windows 9 may focus on cleaning up after Windows 8 by getting rid of some of the software’s least popular features and finally bringing back the beloved Start menu. The rumored “Threshold” update is also expected to create some unity across all of Microsoft’s platforms though, including a simplified app store experience and a version of Cortana for desktop computers.